3x More Electrolytes To Keep You Hydrated. 5x More Powerful Than Leading Vitamin Water Brands. 3x More Electrolytes Than Leading Sports Drinks. 5x More Antioxidants Than Leading Immune Boosting Drinks. EcoDrink Multivitamin Stick Packs refresh and revitalize - without sugar or stimulants - and come in four flavors that are so good you may forget you're drinking a multivitamin! The EcoDrink Daily product is a powerful vitamin and mineral drink mix. This Refill Box contains 30 individual servings (All Berry). EcoDrink is a great tasting beverage that provides your recommended daily allowance of essential vitamins and minerals. 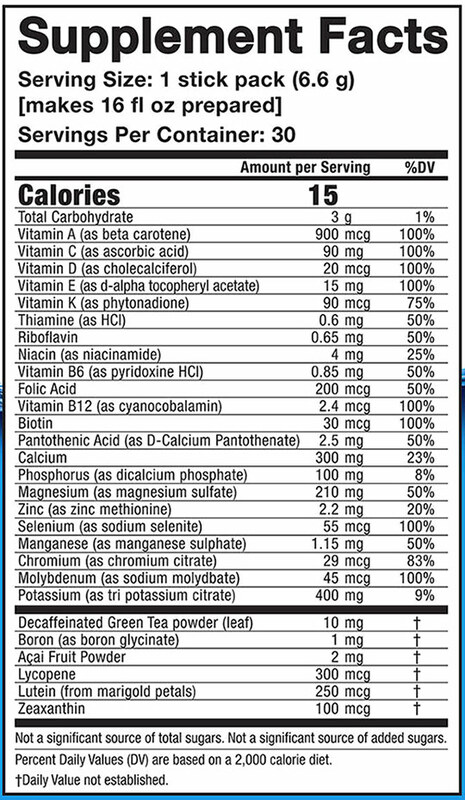 Nutrition facts may differ slightly from different flavors. Disclaimer: The product descriptions and the statements on this page are from manufacturers and/or distributors and have not been evaluated by VitaSprings or the FDA. These products are not intended to diagnose, treat, cure, or prevent any disease. VitaSprings does not imply any medical claims from the customer reviews on this EcoDrink Daily Refill - Berry Flavor, 100% Natural product on this website. Write a Review on this EcoDrink Daily Refill - Berry Flavor, 100% Natural product and share your experience or opinion with other customers. Welcome to VitaSprings Online Store - Source of Your Healthy Life. We carry huge selections of vitamins and supplements, and other different health and beauty products, over 400 brands and 30,000 items now, with new products added frequently. Buy EcoDrink Daily Refill - Berry Flavor, 100% Natural from SGN Nutrition at VitaSprings, and we guarantee you a safe, secure online shopping experience! We value your business greatly and do our best to honor any requests you might have. Our customer service hot line is here waiting for you: 1-626-579-2668.